There is a new Licensing system for version 5.1 (or higher) for PC users. The reason this has to be done is cuz TimeMachine on macOS would break the new 5.0 license system created causing way too many headaches, so I decided to simplify things and ditch the CM Runtime unless you are using a CmStick for both PC and Mac. NOTE: This will not affect CmStick users OR macOS users. Users that are affected are USB Flash Drive, iLok and System bound 5.0 users. You will now get a new License.key file that does NOT use the CodeMeter Runtime anymore to match what I did for 5.0 mac after this problem was discovered. The good news is this will also open up lots of new future licensing possibilities. b) BH is more portable now allowing you to run it without an installer for facilities bot allowing you to run installers. d) Soon you will be able to pull down your license .key file from anywhere in the world with just your email address along with self manageable online licensing coming soon. Only non-CmStick users will need to change to this new licensing system. To do this if running 5.0 just send a new License Request for the same device you are already using. If already running a version 5.1 (or higher) you can submit a License Request just by pressing “Register” button from the Start Screen to launch L.R. now. I know I know this is a bit of a hassle, but it unfortunately has to be done. 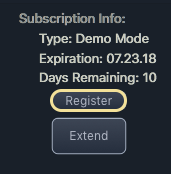 So In exchange for the extra requested 8 mouse clicks from your day, I will add 3 months onto your Maintenance Period as a free bonus. Again this only applies to non-CmStick PC users that this change affects! Update: I will also give PC CmStick users a 3 month extension also if they update their Maintenance Plan this month. So purchase a 12 month extension and get 15 months. I added this so you guys get the same 3 month bonus deal as the non-CmStick guys. You can find the M.P. extension item in the store now.